There are many ways how WPS tiny can be mounted, but care must be taken in order to avoid low signal strength. 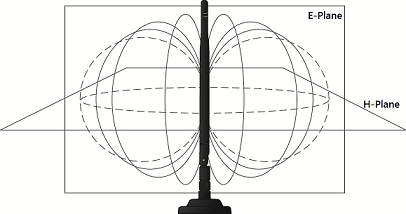 All WPS products come with omnidirectional antennas. Their produced RF waves are not distributed equally across 3D space. Most of the signal power goes only perpendicularly (on H-plane for the image above). Therefore, to obtain the best signal, this property must be taken into account. This video shows how 150m distance can be obtained by using optimal antenna orientation with RF12CH remote. For more in-depth information about RF antennas, have a look here. WPS tiny has two radio modules – one for communicating with RF12CH (315/433MHz) and one for communicating with WPS mote (868/915Mhz). The external SMA antenna is only used for communications with WPS mote, for communications with RF12CH there is a coil antenna inside the case. To extend the range for RF12CH remote - bend the coil antenna outside the case as shown in examples below. See below various examples of good and bad antenna orientations for WPS tiny with RF12CH remote and WPS mote. You want to keep all your antennas in the same plane (y). Image above shows the most optimal and recommended antenna orientation. Image above shows the worst antenna orientation. This orientation should be avoided.